In the previous tutorial you implemented a table-per-hierarchy inheritance pattern. This tutorial will show you how to use stored procedures to gain more control over database access. 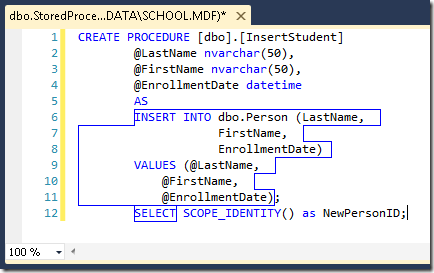 The Entity Framework lets you specify that it should use stored procedures for database access. For any entity type, you can specify a stored procedure to use for creating, updating, or deleting entities of that type. Then in the data model you can add references to stored procedures that you can use to perform tasks such as retrieving sets of entities. 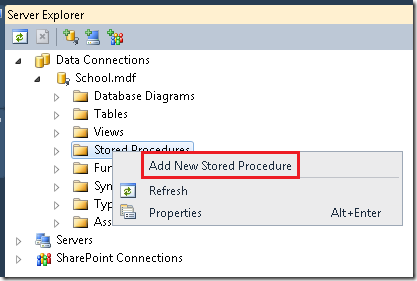 Using stored procedures is a common requirement for database access. In some cases a database administrator may require that all database access go through stored procedures for security reasons. In other cases you may want to build business logic into some of the processes that the Entity Framework uses when it updates the database. For example, whenever an entity is deleted you might want to copy it to an archive database. 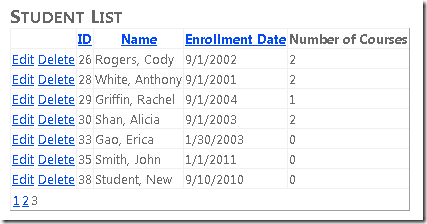 Or whenever a row is updated you might want to write a row to a logging table that records who made the change. You can perform these kinds of tasks in a stored procedure that's called whenever the Entity Framework deletes an entity or updates an entity. As in the previous tutorial, you'll not create any new pages. Instead, you'll change the way the Entity Framework accesses the database for some of the pages you already created. In this tutorial you'll create stored procedures in the database for inserting Student and Instructor entities. 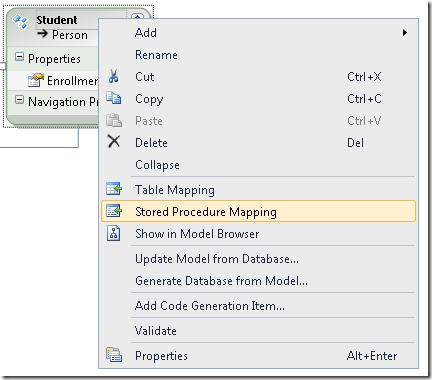 You'll add them to the data model, and you'll specify that the Entity Framework should use them for adding Student and Instructor entities to the database. You'll also create a stored procedure that you can use to retrieve Course entities. 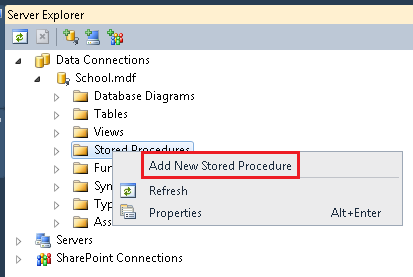 In Server Explorer, expand School.mdf, right-click Stored Procedures, and select Add New Stored Procedure. Copy the following SQL statements and paste them into the stored procedure window, replacing the skeleton stored procedure. 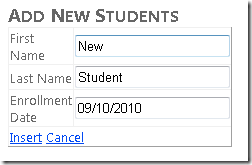 Student entities have four properties: PersonID, LastName, FirstName, and EnrollmentDate. The database generates the ID value automatically, and the stored procedure accepts parameters for the other three. The stored procedure returns the value of the new row's record key so that the Entity Framework can keep track of that in the version of the entity it keeps in memory. Save and close the stored procedure window. In this tutorial you'll map all three functions -- insert, update, and delete -- for each entity type. The Entity Framework version 4 allows you to map just one or two of these functions to stored procedures without mapping the others, with one exception: if you map the update function but not the delete function, the Entity Framework will throw an exception when you attempt to delete an entity. 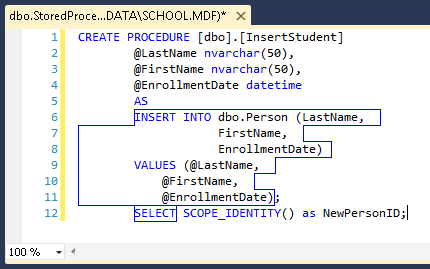 In the Entity Framework version 3.5, you did not have this much flexibility in mapping stored procedures: if you mapped one function you were required to map all three. The stored procedures are now defined in the database, but they must be added to the data model to make them available to the Entity Framework. 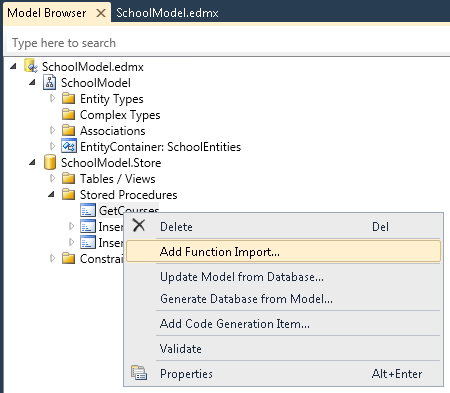 Open SchoolModel.edmx, right-click the design surface, and select Update Model from Database. 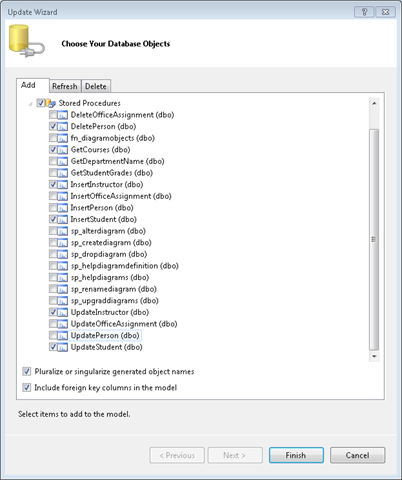 In the Add tab of the Choose Your Database Objects dialog box, expand Stored Procedures, select the newly created stored procedures and the DeletePerson stored procedure, and then click Finish. 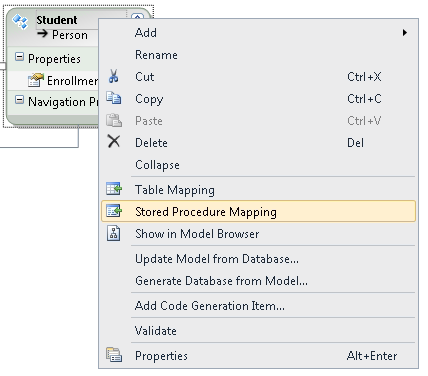 In the data model designer, right-click the Student entity and select Stored Procedure Mapping. 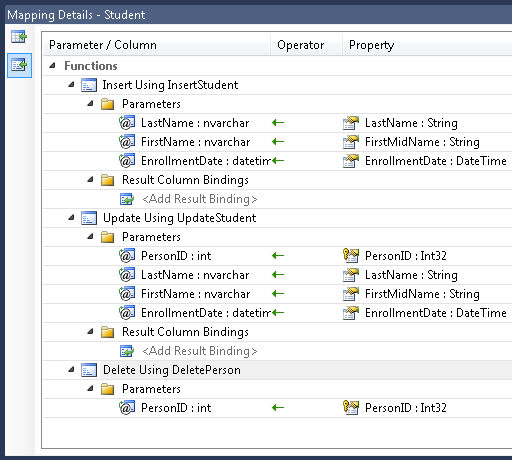 The Mapping Details window appears, in which you can specify stored procedures that the Entity Framework should use for inserting, updating, and deleting entities of this type. In the same Mapping Details window, map the Update function to the UpdateStudent stored procedure (make sure you specify FirstMidName as the parameter value for FirstName, as you did for the Insert stored procedure) and the Delete function to the DeletePerson stored procedure. 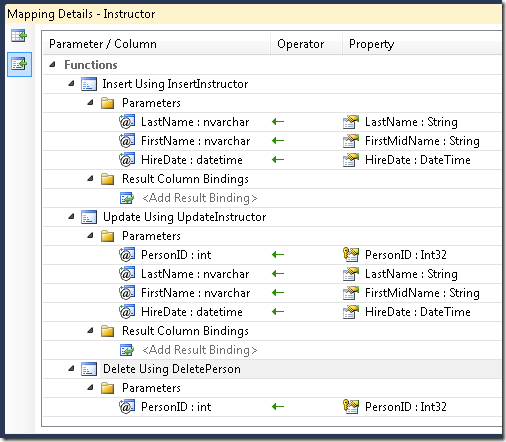 Follow the same procedure to map the insert, update, and delete stored procedures for instructors to the Instructor entity. For stored procedures that read rather than update data, you use the Model Browser window to map the stored procedure to the entity type it returns. 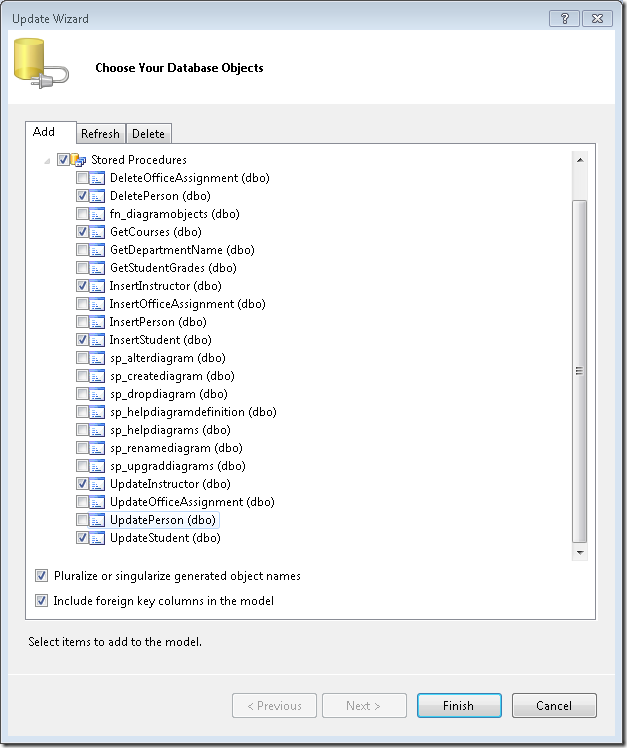 In the data model designer, right-click the design surface and select Model Browser. Open the SchoolModel.Store node and then open the Stored Procedures node. Then right-click the GetCourses stored procedure and select Add Function Import. 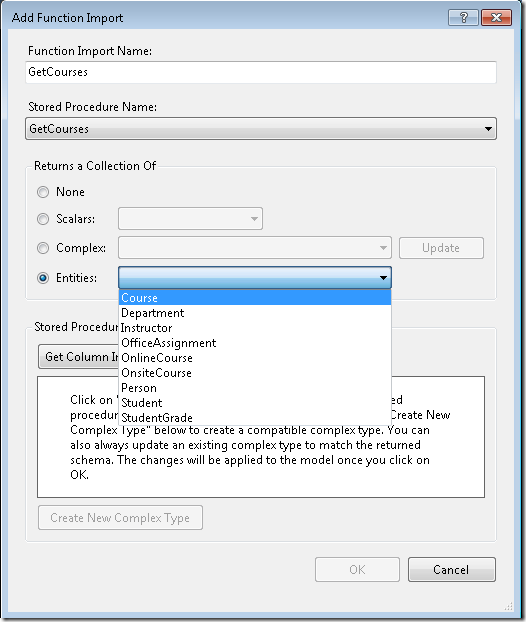 In the Add Function Import dialog box, under Returns a Collection Of select Entities, and then select Course as the entity type returned. When you're done, click OK. Save and close the .edmx file. 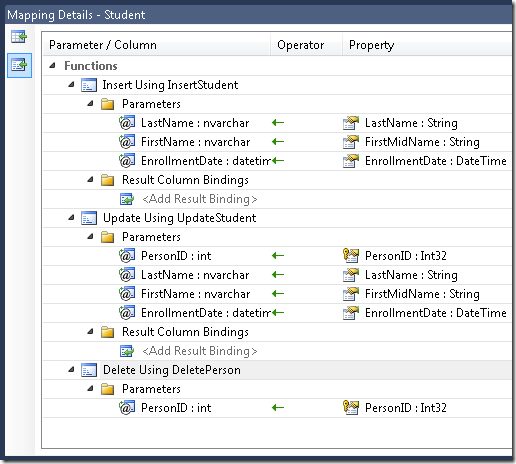 Stored procedures to insert, update, and delete data are used by the Entity Framework automatically after you've added them to the data model and mapped them to the appropriate entities. 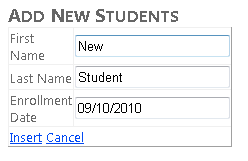 You can now run the StudentsAdd.aspx page, and every time you create a new student, the Entity Framework will use the InsertStudent stored procedure to add the new row to the Student table. 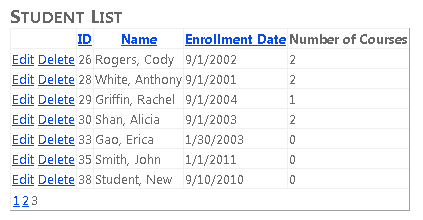 Run the Students.aspx page and the new student appears in the list. Change the name to verify that the update function works, and then delete the student to verify that the delete function works. The Entity Framework does not automatically run stored procedures such as GetCourses, and you cannot use them with the EntityDataSource control. To use them, you call them from code. 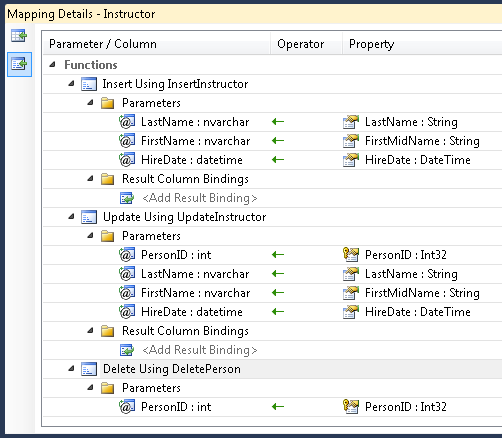 The page now uses the GetCourses stored procedure to retrieve the list of all courses. Run the page to verify that it works as it did before. In the next tutorial, you'll learn how to use Dynamic Data functionality to make it easier to program and test data formatting and validation rules. Instead of specifying on each web page rules such as data format strings and whether or not a field is required, you can specify such rules in data model metadata and they're automatically applied on every page.